There’s Always Something Of Interest At Woodcrest Village. 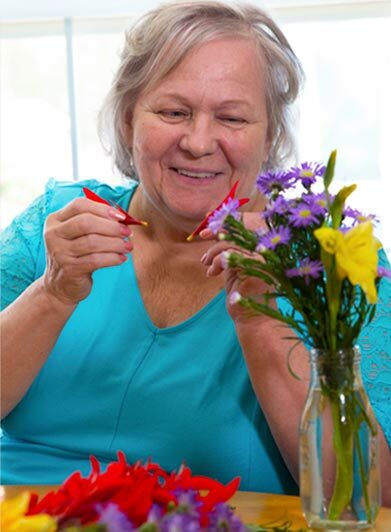 Activities at Woodcrest Village Assisted Living are suitable for every level of ability and interest. Whether it’s swapping stories over a beverage at Waldo’s Pub, arts & crafts, playing board games, poetry readings, sing-a-longs or any of a number of other life enrichment interests, the residents at Woodcrest Village are engaged and active. There is always something interesting to do at Woodcrest Village! Woodcrest Village residents gather daily from 4:30 to 5:30 p.m. for social hour at Waldo’s Pub to enjoy a beverage and the company of friends, family, and volunteer bartenders. Woodcrest Village is dedicated to providing assisted living services in a gracious community setting that allows its senior residents to live a full, healthy life. Together, we help to foster independence, nurture spirit, and encourage family and community involvement.